Students’ report cards glow at this unusual, small school. Their test scores look good, too — but they don’t shine as brightly as their grades. 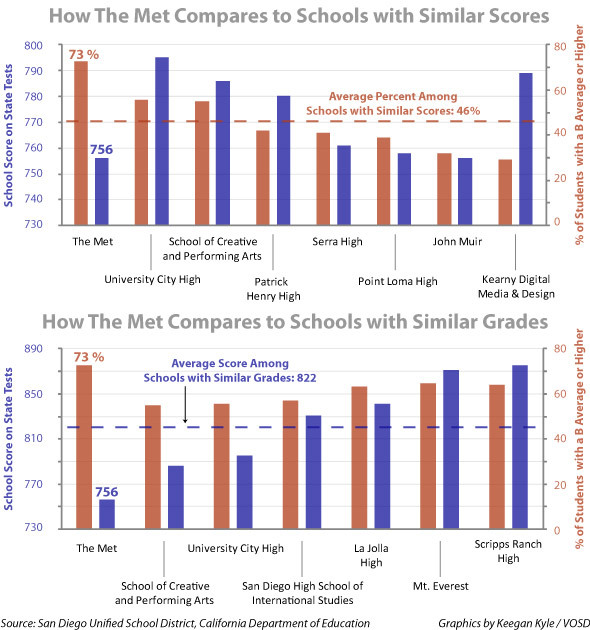 Students at the San Diego Metropolitan Career and Technical High School, known as the Met, were more likely to get As and Bs than kids at any San Diego high school last year. Nearly three out of four students had at least a B average in grades 10 to 12, almost twice the average at local schools. While Met students got the highest grades, they didn’t have the highest scores on the range of tests eyed by colleges and the state, a voiceofsandiego.org analysis found. Other high schools with stellar grades also have top scores on state tests, SATs and ACTs. But the Met doesn’t. That doesn’t mean the Met is struggling. The unconventional school scores extremely well compared to California schools with similar demographics. Graduation rates are superb. Very few students fail the high school exit exam. And almost all its students take and pass the classes needed to apply for University of California and California State University colleges, a big feat in a district where only 33 percent of students do the same. But Met students don’t do as well as their exemplary grades would predict in San Diego Unified. Other local schools with similar scores have significantly lower grades. For instance, John Muir School got the exact same score as the Met on state tests, but only 32 percent of its students had a B average or better, versus 73 percent at the Met. The Met is already under the microscope after school district investigators found that grades were changed, an investigation now in dispute. But even if nobody did anything wrong at the Met, the gap between its grades and test scores begs a bigger question, one that goes far beyond the debate over grading at this small school: What are grades supposed to mean? Grades matter intensely to students. They dictate whether kids go to San Diego State University or summer school. Yet grades are so subjective that nobody can really say what they represent. The As, Bs and Cs that decide futures aren’t tied to any common standards, leaving different schools and different teachers to judge students in totally different ways. Our analysis of grades had some shortcomings. High school grades include subjects that aren’t on state tests. The Met is also very small, which means its scores can change dramatically even if just a few kids slip up. But the biggest problems with analyzing grades may be the inconsistency in grades themselves. The gap between the Met grades and test scores may not be a bad sign. It could be that the Met just judges kids on different skills, ones that aren’t measured well by the SATs or state tests. It could also be that when the Met eliminated the D grade, it spurred teens to work harder and not squeak by. The D lets a student pass but doesn’t count on UC or CSU applications, which is why the Met got rid of it. And it might be that the Met’s unique take on grading affords students more chances to earn a good grade that better reflects what they can do. The Met lets students improve their grades over time, even months or years after they get them, showing what they’ve learned through projects, exhibitions and other work. The Met’s principal, Mildred Phillips, didn’t comment specifically on the VOSD analysis, but argued it was inappropriate to judge her school against traditional schools in the district. Teachers at the school didn’t respond to emails. “The Met is a shining example of the power of flexibility,” Phillips wrote in an email. The grading gap could also be a sign of grade inflation: students getting As for the same work that would get Cs or Ds elsewhere. Several Met alumni complain that grading was too loose, letting them coast. Four out of 10 graduates interviewed said they didn’t find their classes challenging. But the six other graduates said they worked to the bone for As and Bs. The data alone are too little evidence to say whether the grading gap boils down to grade inflation or something else entirely. The question of when it is OK to actually alter a grade — and how — is at the heart of the dispute over whether the Met illegally changed grades. In August, school district internal auditors found that the Met changed more than 70 grades that students had earned in other districts, sometimes on the same day they enrolled. Fs and Ds became Cs. While the Met allows students to increase their grades by doing more work later, auditors argued the school couldn’t legally go back and change grades given by other school districts. But San Diego Unified began investigating how the audit was done after Met staff complained that auditors were lax about interviewing them. Because of lingering questions about the audit, the school board hasn’t acted on the findings and is now seeking a second opinion about the Met’s approach to grading. The Met, founded six and a half years ago, combines personalized learning with hands-on experiences where teens can pursue their passions. Roughly 200 students spend two days a week at internships and take classes at San Diego Mesa College where the tiny school is housed. The program is rooted in the Big Picture philosophy, which stresses real world learning and life skills that go beyond typical standardized tests. Students get a single advisor who follows them for years and writes painstaking assessments that go deeper than grades. They also give students letter grades in English, social studies and art; other teachers grade students in math, science and languages. The Met is as hard to stereotype as its students, a diverse mix of white, black, Latino and Asian kids that nearly mirrors the makeup of the whole school district. More than half of its students are poor enough to qualify for free lunches. It isn’t a remedial school. It isn’t an elite one. It’s just different. Grades are like inkblots up for interpretation. An A is not an A is not an A. From school to school and teacher to teacher, the bar is set all over the place, which could be why even Met students disagree about how tough their school was. One federal study found that B students in poor schools and D students in affluent ones got similar scores on a national exam. Nobody even agrees about how to weigh work to come up with a final mark. Grading researcher Douglas Reeves complains that you can show the same quizzes, homework and tests to a thousand teachers — and get a thousand different grades. Behind the haggling over how to count homework is a deeper question: What should grades mean? Do they stand for how much kids learn, how hard they work, or how they behave in class? Should teachers save As for the cream of the crop or give them to anyone who aces the class — even if everyone does? Grades can mean just about anything, often many things at once. Experts disagree on whether rising grades across the country are a sign that teachers have softened the standards for an A or simply that kids are doing better. Between 1990 and 2005, the average high school GPA grew from 2.47 to 2.77, according to a national study of high school transcripts. But inflation or not, education experts are concerned when kids get good grades for not-so-good work. Nearly half of 2005 high school graduates who got an A or B in high school algebra and went on to take the ACT in mathematics fell short of the college readiness benchmark in math, another study found. Educators argue that grades can also be unfairly deflated. Reeves campaigns against giving zeros, which can torpedo grades based on early failures, even if students do well later. That is one selling point of the fluid system that the Met uses: that it doesn’t punish kids for not getting it right the first time. San Diego Unified started using a new report card for younger students a few years ago that evaluates students based on specific standards, something Reeves and other experts champion. But districts have been more reluctant to regulate high school grading. The siren song of college raises the stakes. Dilia Vasquez loves, loves, loves the Met. Vasquez said even after she got pregnant, the school showered her with one-on-one attention and care, and she graduated with a 3.8. But when she got to San Diego State, Vasquez said she didn’t know what a thesis statement was and had to take remedial English. She told her former advisor that the school should tweak some small things to make sure that other students didn’t run into the same problem. Vasquez still says the school did a good job preparing her for college. “I would recommend the Met to anybody,” she said. The slipperiness of grades can cause real problems. If kids go through high school snagging As and Bs, they and their parents likely believe they’re ready for college. Yet many shining students suddenly fall short when they get to campus. Nearly half of California State University students needed to take remedial classes in English last year, even though their average GPA was higher than a B.
Professors say part of the problem is that high schools and colleges just aren’t teaching the same skills. No school in San Diego has fixed that problem — not top-scoring schools and not even the Met, whose students graduate with college credits and usually go on to four-year colleges. Thirty-three Met students went on to San Diego State in the last three years, but only four tested well enough in both English and math to avoid remedial classes. While the San Diego State students are only a slice of the Met graduates, they are one sign of the rude awakening students can get in college. Seeing that happen bothers Bernabé Ceseña Jr., a Met valedictorian with a 4.0 who is headed to University of California Berkeley this year. He didn’t have to take any remedial classes. But he wonders why his classmates do. Please contact Emily Alpert directly at emily.alpert@voiceofsandiego.org or 619.550.5665 and follow her on Twitter: twitter.com/emilyschoolsyou. Emily Alpert was formerly the education reporter for Voice of San Diego.